A GeekyMomma's Blog: Where Have All The Bloggers Gone? Let's face it, blogging is not rocket science. Everyone has something to say (just spend some time in the back row of a faculty meeting). 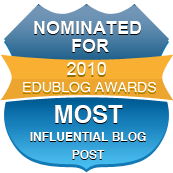 So, why is it that there are SO many educators, but so few EduBloggers? Is it too intimidating from a technology standpoint? or perhaps it comes down to being in Jen Wagner's Land of YeahButz, with lots of excuses (many of which are very valid)? Don't you think we need a few more diverse bloggers out here? If you take a look at most blogrolls, you'll see the same names. Not that there's anything wrong with the blogs that are listed. Most are awesome blogs that I read as well. My point is though that we run the risk, if we haven't already, of becoming a huge echo-chamber. It's great fun and sometimes stimulating, but there are many thoughts out there that haven't been made digital yet. There's this site called Posterous where anyone can blog if they can send an email. You simply write your post in an email and send it to your own personal Posterous email address. You can add images and links, too. For advanced users, you can edit your blog post from the Posterous site as well. I think this really opens the doors to all those educators and students who would like to dip in their toes but may be intimidated by blogging technologies.I'm curious if you think an application like this might actually prove useful in a classroom. Would more teachers blog if it were this much easier? or is the problem much bigger? Good topic. I'm not sure that the reason more teachers don't blog is due to a technology hurdle. I think there are two reasons why more teachers don't blog. First, some teachers may be fearful of posting too much of their opinions and having it come back to haunt them later. 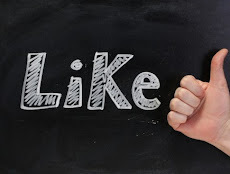 Much in the same manner that we warn kids not too post on Facebook things that may hurt them later, teachers don't want to post something that may hurt them later. Second, and probably the bigger reason why more teachers don't blog, they think that no one is reading or no one is interested in what they have to say. I see lots of blogs that started out great, but after a couple of weeks the posting became less frequent and eventually stops. When I started my blog there probably were not 10 people that read it in the first month. I continued to write anyway because I enjoyed writing and enjoy trying new technology apps. If new edu-bloggers did a little subtle self-promotion on places like Twitter or Facebook, they would get more readers and will be more likely to continue blogging and expanding the edu-blogger echo chamber. Lee, what a great post. I agree with Richard. I do not think the hurdle is a tech thing, I think it a mindset thing. Many teachers I work with do not see themselves as "tech saavy", but more importantly do not believe in their own voice. There is a misconception that "writers" are those guys on the shelves at Barnes and Noble. 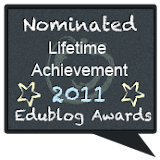 You are right on that anyone can and should blog, especially talented and passionate educators. It comes down to training, time, and support for that to happen. Thanks for starting this conversation, and encouraging ALL writers to share their knowledge, expertise, and unique gifts with the world! know plenty of teachers who blog, but they do it under the auspices of anonymity and they don't even go near the topic of education. Some of it has to do with making sure internet savvy kids don't find and flame them, but a larger part of it has to do with making sure their administration never finds out. My feelings are SHOULD and DOES ever teacher need to blog....and my answer is no. There are days when I probably should not blog -- because it was just a waste of bandwidth space and I contributed nothing but a bit of ego to myself. The question to me is WHY should they blog? and if they don't know that, then I don't think they should. And though I agree muchly with Mr. Bryne....I have to say that I don't think it is a matter of fear anymore.....I think it is a feeling of "I have enough on my plate and I can't even think of adding one more thing." I believe most teachers don't blog for 2 simple reasons. 1. They don't feel they have the time. 2. They don't know what to say. And I think when they truly realize what IT IS that they wish to say....they will begin to FIND THE TIME.....and place their voice out there to share in some way. As a principal who is cheerleading my teachers onto a paperless school (baby steps), I would like to add to this important conversation. Teachers need to understand and feel and experience the purpose in blogging. Most technology is DONE to them--and often, they have very little support/training provided. If they see the purpose for learning (students and themselves) and have models for how to execute---and feel that they can ask questions without feeling stupid, more will blog. Like anything in a teacher's world of constantly changing curriculum, expectations (from parents, administrators and students), they need to be able to trust that the time put into learning how to blog will equal improvement in learning for themselves and their students. As a tech geek principal, I do my best to model--guide--release--and celebrate every little bit of progress my teachers make in the blogging world! I do agree with Mr. Byrne that promoting school blogs through twitter and Facebook increase visitor activity. I would add that encouraging teachers to visit other teacher blogs and comment can't be left unsaid. This is safer for those who are hesitant to facebook, etc. As soon as districts begin to truly promote blogs for learning rather than a "checklist item" for the technology report, we will make more progress and hear from more teachers. We have to hear from teachers so we can begin to hear from STUDENTS! These are the most powerful voices. Thanks for the opportunity to contribute my thoughts. I have to agree with some of the previous comments. As a teacher, I am confident in my abilities. I am also confident that what I have to say is important to the teachers that I work with. However, I am not as sure (as Mr. Byrne pointed out) that there is a broader audience for my thoughts/help. I also believe that teachers are so swamped with assessments and curriculum that some of their more creative juices are being zapped. They just don't have the time or energy to put their thoughts into writing to share with others. As more and more is being asked of educators during the school day it is no wonder that they do not have a voice left with which to speak. 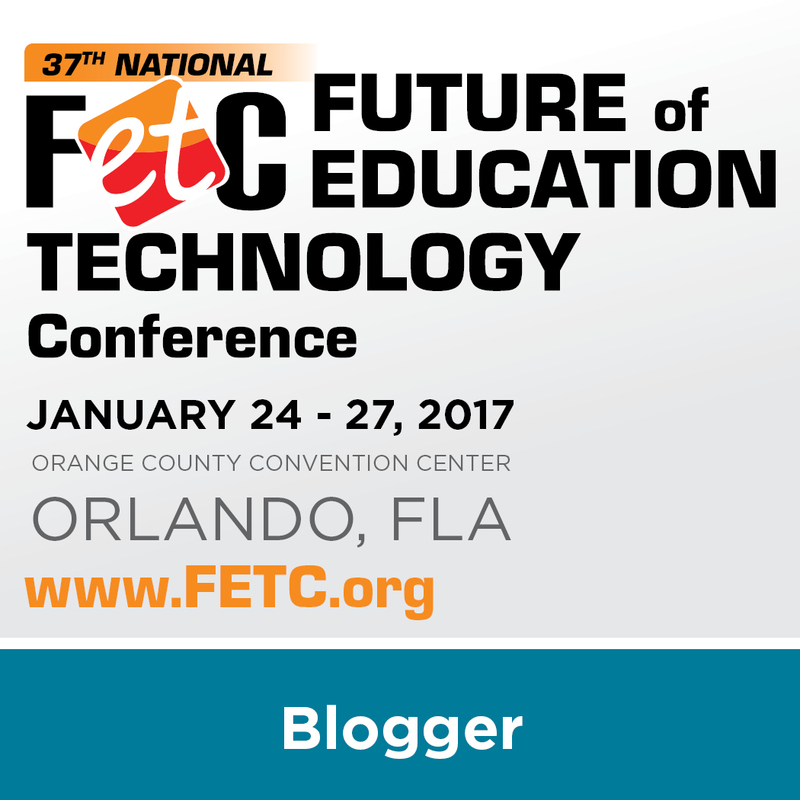 My hope is to show teachers in my district (at least) that there is a place for blogging in education. 2) It's not that my opinion isn't important BUT I don't feel the need to self-promote. I'd rather read about successful experiments and projects in EdTech as opposed to debating whether one strategy is better than the other. I can decipher this myself. My 2 cents. When I began blogging over 4 years ago, I did feel like every teacher should be blogging. At the time, it was one of the simplest ways to share. Now there are so many more options. Not every teacher should blog but everyone should share. Pick the ideas and the ways you want to do that but you need to share, it's a professional responsibility. The fact they don't is cultural. We haven't made it mandatory or at least expected. Our culture is one of isolation where we close the door to our classrooms and hope no one asks questions about what we do. If there's one benefit of excessive testing it might be to open up our classrooms to examine practices. Not saying that's happening but if it does lead teachers to talk about practice, that's a good thing. On another note, thanks for highlighting posterous. I've seen it but not explored it. I'm thinking of using it with students using blackberrys. They should be able to post to a single site. I think. I can see/echo the concerns of some who have posted comments - @Hayden brings up the issue of writing critically and worrying about reaction from administration/students/parents. I do worry about that sometimes and I am careful about writing because of it. I agree with @anonymous and @Dawn that there are days when I just don't have time and I don't know what to say. But I don't think that people need my help. That's not why I blog. I use my blog to reflect for my own practice, and it gets me writing which makes me a better teacher of writing. I have those moments in a class that I just want to tell someone about, I put them in my blog so I don't forget them. I only know of one person at my school curious enough to read my blog. When I mention that I write a blog to the principal or a colleague, they just look at me blankly. Blogging has always been a secret desire of mine, but only until now do I feel that it is something I can undertake. As a teacher, there always seemed something more pressing that had to be done. When I did find myself writing about a specific incident or situation, I only revised it to death and ended up deleting it. Part of blogging for me at the time was merely to get it off my chest. I agree with Angela, teachers just do not believe in their own voice. Sometimes I sit and think about all the times I guided students through the writing process, and yet I have such trouble myself. I also enjoy reading more than I do writing. Twitter has helped me to develop a sense of voice, in that it provides a platform to interact and freely comment. This has helped to encourage me as a new bloggger. It's funny, I have tried to leave a comment 4 times now (in the last 2 hours) and I keep getting interupted. I think I am an average teacher and definitely typical of the teachers at my school and that means I just don't have time to do anything else - my plate is full!. Why? Well, I have duty before school, I teach all day with just a lunch break, I tutor students who are required to prep for the state tests, and then I get home - 11 hours after I left in the morning. At home there's meals to prepare, kids to take to sporting events, homework to help with, and time to just be "Dad." I don't have time to prepare for class and grade papers to the level I would like. I get up at 5 so I can run before the school day starts. so, when do I fit in a blog? To keep connected to my PLN, I read my RSS feeds on the weekend. I spend time on Friday nights and some during the weekend on twitter so that I can see what others are doing. Do I fit in a blogpost then? What about weekend sporting tournaments and my wife, of nearly 20 years? Speaking of her, my wife's blog is 3 years old this week and she spends hours every day marketing and managing the blog. When do I do that? I admire the heck out of you guys who do write frequent blog posts, but I can't figure out, for the life of me, how as a teacher, you do it. Thank you though and don't stop. Chris and others have brought up a question that I am frequently asked, "how do you find the time to write 4 or 5 blog posts everyday?" I find myself writing or reading something during almost every free minute of my day. Often I'm cooking dinner while reading my RSS feeds or Twittering. That said, I also don't spend as much time on my other hobbies as I used too. I also don't have any kids and my girlfriend is also a teacher (but not a blogger) who spends a lot of time doing school work in the evenings. I'm not sure how teachers who have kids and non-teaching spouses can blog frequently. Gary Vaynerchuk speaks to aspiring entrepreneurs about this topic of "finding time" quite a bit. His advice is always something like "turn off Lost." That's fine advice for people that are trying to launch a new business, but if you're just trying to find time to blog I'm not sure that is an appropriate answer. As a new blogger myself, I would say that much of it probably boils down to fear and courage. I was and am still fearful of putting my thoughts and ideas out there. I have found myself getting caught up in little details of the blog to avoid putting my blog out there. I have felt that I may not be worthy to join the ranks of edu-bloggers out there whom I read daily and look to as sources of valuable information and insight. In this era of ease of publishing, I find it intimidating to have so much power to put my thoughts out there, but the fulfillment that I have found this week in making a commitment to my blog and putting it out there has been invaluable. I think if we can be open and honest about the struggles we face when blogging, other amateur bloggers, such as myself, will find it easier to push through the fear and find their voices. I am thankful for the dialogue I have been able to find in exploring my new PLN. Thanks to all of you who contribute daily to my life. As so many have said, I think one of the biggest issues for blogging (or for any other use of technology for that matter) is the feeling that there isn't enough time. I notice a glaring absence of classroom teachers in my blogosphere - not the tech ed teachers, but the ones teaching 5 (or more) core subject courses each day, attending IEP meetings, grading dozens (if not hundreds) of papers and projects, posting assignments to Edline (and similar sites), communicating with parents, and in the midst of it all planning thoughtful, motivating lessons. And, oh yeah, having time with family and friends. Having said all that, blogging has led to a significant change in how I approach my teaching and my own professional development. I also notice (in my building anyway) that teachers feel like their opinion/voices are not at all valued. 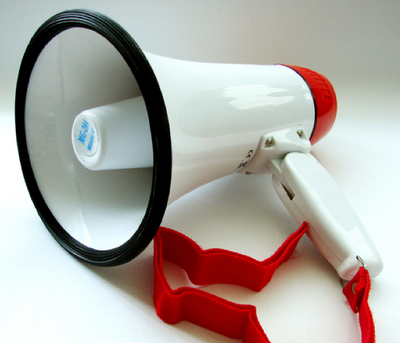 If our voices are not heard within the borders of our own district (at least that is the impression for many), then there is a risk in raising your voice to be heard in the blogosphere. I've been at it a year and I love it! I teach history and I use my blog in 2 ways: to answer questions raised in class that are off-topic when there is really only interest by one student and secondly to make connections between things we learn in class and the world outside of school. Often students comment on their own...one a month or so I will make them comment as a homework assignment. I can "see" that a lot people are coming to my blog, but normally only my students comment. It would be great to have some outside opinions as well. Also, I have tried to find other classrooms of similarly-aged students to "blog-pal" with....and am disappointed that there aren't more of us out there. I will say that it is time-consuming.....here I am working on my blog--and getting ideas from you--when I should be correcting papers.